Have you ever noticed that most homes you see don’t have triple pane windows? Did you ever wonder why? Double pane windows have been the industry standard for many years and are far superior to the old style windows that have only 1 pane of glass in them. 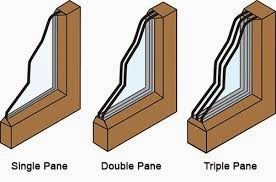 So why aren’t triple pane (also known as triple glazed) windows more popular? The simple truth of the matter is that the added cost of triple pane windows simply isn’t worth the investment. While it’s true that the addition of a third layer of glass does reduce condensation and help to reduce cold drafts, the energy savings as compared to double pane windows is minimal. Even in the colder states (such as New England) the energy savings is only 2% - 3% over the standard double pane window. When we compare the additional 10% - 15% initial cost to the possible 3% in energy savings it would take a very long time to realize any savings. Let’s say that you spend on average $1,000 on your energy bill (a very conservative figure). If your home has 20 windows and you lose 22% of your energy through your windows, (which is about average) than this would mean that each window is costing you about $11 a year in wasted energy. Believe it or not, a triple glazed window will only save you about $1 a year! The math is simple enough to understand. Even if you only paid $30 per window to upgrade from double to triple pane, it would take 30 years of energy savings just to break even. Not a great investment in my personal opinion. It’s also worth noting that the majority of window companies in the U.S. don’t even offer triple glazed windows. Although double pane windows have been around for a long time, they are still your best bet if you decide to replace the windows in your home. If you currently have only single pane windows the energy savings will be significant in comparison and an excellent investment.